Posted: Monday, June 11, 2018. 4:36 pm CST. By BBN Staff: On Saturday, June 9, OCEANA held an award ceremony in correlation with the national activities for World Oceans Day 2018. Oceana in Belize and the Belize Coalition to Save Our Natural Heritage officially recognized the Government and people of Belize for their collective leadership in establishing the world’s first indefinite moratorium against offshore oil. The Ocean Champion award was formally presented to Prime Minister Dean Barrow. In presenting the award, Oceana’s Vice President for Belize, Janelle Chanona, emphasized that the significance of the moratorium cannot be overstated, given the daily dependence of tens of thousands of Belizeans on healthy marine resources. “We are world leaders……We are proudly loving and protecting the tens of thousands of Belizeans who depend on our world-renowned marine resources. This decision reflects the reality that we may be small but we are strong. And will continue to ensure that this law inspires others to follow the exemplary leadership of the Government and people of Belize,” Chanona stated. Barrow acknowledged both citizenry and civil society in Belize’s historic decision to safeguard marine assets from the inevitable destruction of offshore oil. 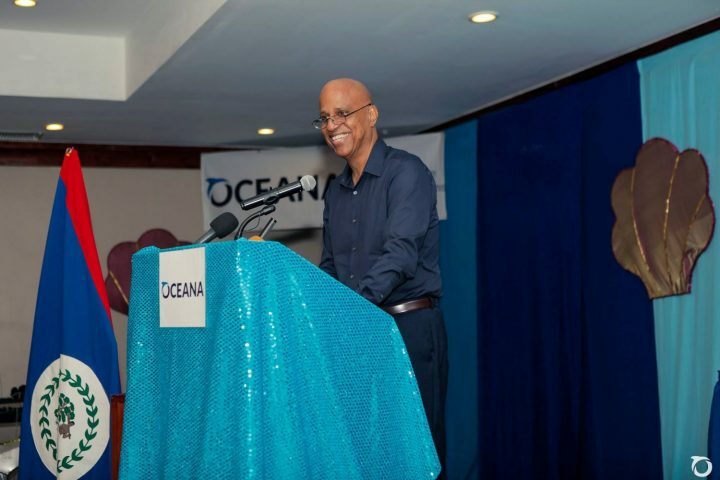 “I’m grateful at being honored by Oceana in Belize in recognition of Government’s role in passing the legislation banning offshore oil exploration in our country. Let me say right off the bat though, that while the particular step with respect to banning offshore oil exploration in our country is extremely important, it is of course, just one step. As the speakers before have made clear, ocean conservation is an ongoing exercise necessitating the deployment of constant vigilance and a toolbox updated as required in view of the continuing challenges,” Barrow remarked. The closing remarks of the ceremony were delivered by fifteen-year-old Wavemaker, Sofia Reyes of E. P. Yorke high school. Reyes closed by thanking the Government and people of Belize as well as OCEANA and conservationists. The Petroleum Operations (Offshore Zone Moratorium) law, which indefinitely prohibits offshore oil exploration and drilling everywhere in Belize , became law on December 31, 2017. Since it was enacted, Oceana has referred to it as “The People’s Law” because it has been the unwavering position of the Belizean people that the risks associated with offshore oil are simply too great; any “benefit” is short term and the damage to quality of life, job and food security is irrevocable.